Approximately half of the stars in our galaxy are members of so-called binary star systems. Such systems consist of two stars, of mass and , and position vectors and , respectively, orbiting about their common center of mass. The distance separating the stars is generally much less than the distance to the nearest neighbor star. Hence, a binary star system can be treated as a two-body dynamical system to a very good approximation. where is specified in Equation (4.112). Figure 4.8 shows an example binary star orbit, in the center of mass frame, calculated with and . 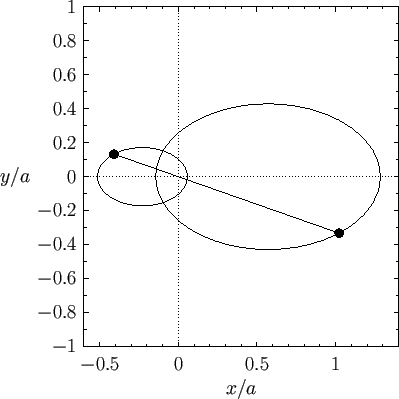 It can be seen that both stars execute elliptical orbits about their common center of mass, and, at any point in time, are diagrammatically opposite one another, relative to the origin. Figure 4.8: An example binary star orbit. Binary star systems are very useful to astronomers, because it is possible to determine the masses of both stars in such a system by careful observation. The sum of the masses of the two stars, , can be found from Equation (4.116) after a measurement of the major radius, (which is the mean of the greatest and smallest distance apart of the two stars during their orbit), and the orbital period, . The ratio of the masses of the two stars, , can be determined from Equations (4.118) and (4.119) by observing the fixed ratio of the relative distances of the two stars from the common center of mass about which they both appear to rotate. Obviously, given the sum of the masses, and the ratio of the masses, the individual masses themselves can then be calculated. Incidentally, an obvious corollary of the material presented in this section is that we can correct the two-body solar-system orbit theory outlined in Sections 4.1-4.15 in order to take into account the finite mass, , of the orbiting body, compared to the solar mass, , by replacing by wherever it appears in the analysis. For instance, Equation (4.40) generalizes to give .